Nearly 12 hours after being placed in Palm Beach County Jail following an arrest early Monday morning for driving under the influence in Jupiter Island, Florida, Tiger Woods released a statement explaining the incident from his point of view. "I understand the severity of what I did and take full responsibility for my actions," he said. "I want the public to know that alcohol was not involved. What happened was an unexpected reaction to prescribed medications. I didn't realize the mix of medications had affected me so strongly." Despite that claim, Woods went on to apologize for the incident and negative publicity. "I would like to apologize with all my heart to my family, friends and the fans. I expect more from myself, too," he said. "I will do everything in my power to ensure this never happens again. "I fully cooperated with law enforcement, and I would like to personally thank the representatives of the Jupiter Police Department and the Palm Beach County Sheriff's Office for their professionalism." It is expected that additional information, including a dash cam video, will be released by authorities when offices open on Tuesday. Woods is currently in the middle of resting and rehabilitating his lower back after undergoing a fourth back surgery. He has not played since February when he withdrew from the Dubai Desert Classic in Round 2. Woods said on his website just last week that he's intent on returning to professional golf and grateful for some pain relief in his body. 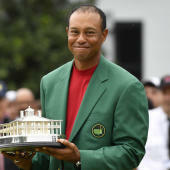 "It has been just over a month since I underwent fusion surgery on my back, and it is hard to express how much better I feel," Woods wrote. "It was instant nerve relief. I haven't felt this good in years."